Like many people, I look forward to reading Robert Genn’s Twice Weekly blog. If you aren’t familiar with him, Robert Genn is a Canadian landscape painter who happens to write extremely well. Each entry is an insightful essay marked by a generosity of spirt. One entitled “Summer Joy” caught my fancy well enough to check out the accompanying video: http://clicks.robertgenn.com/summer-joy.php. I was not taken by the chanting on the video sountrack, but I was transfixed by the views of the island and particularly the flowers at Hollyhock, a beautiful retreat on Cortes Island, BC where Robert and his daughter Sara teach painting workshops. There is somthing irresistable about an island garden–a place of isolation and serenity that draws creative types like flies to honey. 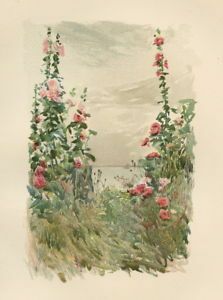 After watching the demostration where Robert Genn paints hollyhocks in the garden, I was seized by an urge to grab my cherished copy of Celia Thaxter’s An Island Garden and take a dip in my own virtual island retreat. You can read the book on line at http://digital.library.upenn.edu/women/thaxter/garden/garden.html but, while I have winnowed away many books in my library, I will never part with my reproduction of the original with its gold-embossed cover and Childe Hassam illustrations. The physical beauty of the book matches its content. Celia Thaxter grew up as the daughter of a lighthouse keeper on Appledore Island in the Isle of Shoals, a cluster of windswept rocks off the coasts of New Hampshire and Maine. According to the preface, Celia Thaxter started gardening at the age of five and never stopped. As an adult, she wrote for the Atlantic, mostly indifferent poetry, which was popular at the time, but her garden and her description of it were her crowning achievements. 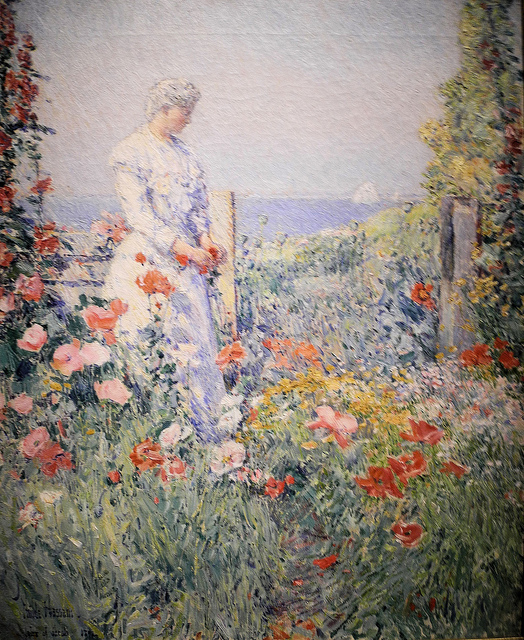 At her home on the island, she entertained many New England artists and writers including Ralph Waldo Emerson, Nathaniel Hawthorne, Henry Wadsworth Longfellow, John Whittier, and Sarah Orne Jewett, One could argue that American Impressionism was born in her garden. For William Morris Hunt and Childe Hassam, who were close personal friends of Thaxter, this was their Giverny. The style of tonal paintings bear all the hallmarks of hazy summer days by the sea. I have a foggy recollection of seeing the American Impressionist paintings at the Florence Griswold Museum in Old Lyme, Connecticut when I was a child. When I go back east, I’ll have to make a pilgrimage. Plus, on the website, it looks like they have a pretty little garden out front and a sculpture park in the back.